The reference to Claudius in v 2 puts the events of this chapter within the years of his reign, 41-54 CE. Additional details place it between 49-53 CE; however there are some contradictions, and Luke’s account in Acts “may be a conflation of various traditions and not entirely accurate.” (Wikipedia) What a surprise. In v 6, we are back to ranting about the Jews, and Paul makes the strongest statement against them yet, then gives up on them in favor of the Gentiles. In v 9, Paul has another ‘vision’; I’d sure like to know exactly what these were. Dreams? Drugs? In v 12-17, the Jews trump up more charges against Paul, but they are tossed out by Gallio. Gallio was a Roman senator and brother of famous writer Seneca. He is most remembered for his disregard of Jewish sensitivities and impartial attitude towards Christianity in this case. Gallio’s tenure can be fairly accurately dated to 51-52 AD, which is significant because it is the most accurately known date in the life of Paul. 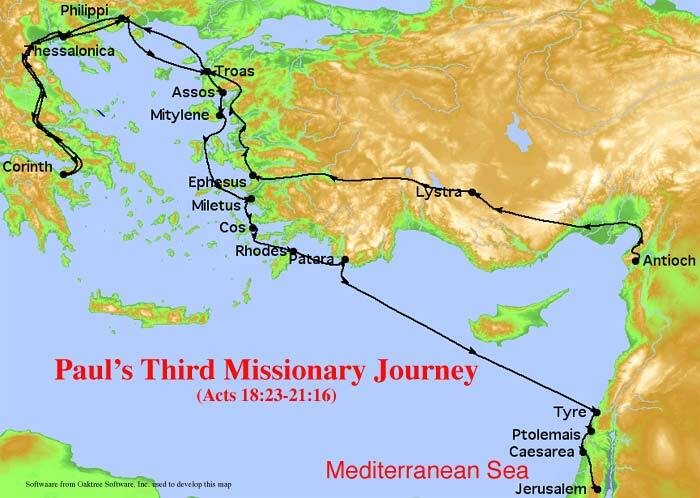 Paul sets out on his third missionary trip, which took place between 54-58. In the next section (v 8-21) I feel like we’re back in the gospel of Mark, with its emphasis on magic tricks. Paul holds daily lectures in the School of Tyrannus – I looked this up but nothing is known about it; it’s thought to refer to a Greek scholar or rabbi who operated a school. Anyway, after 2 years of preaching, Paul has reached everyone in Asia (Minor) – an exaggeration, for sure. (Some modern translations remove the word ‘all’ from v 10 to make the claim more plausible.) Then we get to the hocus-pocus part – it contains all the characteristics of an urban legend. 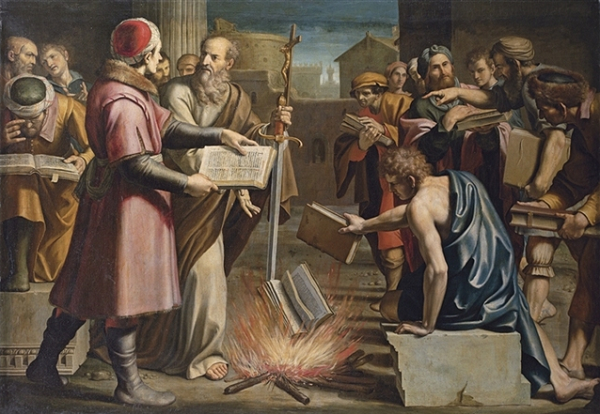 And that’s followed by the first Christian book burning – a dubious event to record and brag about. The last part of the chapter deals with a near-riot caused by the effect Paul’s preaching was having on local businesses. In v 33, a man named Alexander is pushed to speak. Who the heck is he? I thought I had missed something, but no; a quick check of bible commentaries shows that no one really knows who he was, or even if he was a Christian or a Jew, or why he was put forward by the Jews. There is some speculation that he may be a coppersmith briefly mentioned in 2 Timothy 4:14, who caused trouble for Paul, but we haven’t gotten to 2 Timothy yet, so I’ll leave it to consider later. My only other thought on this incident is that I think the words of the mayor, or town clerk, starting in v 35 are entirely reasonable, and demonstrate that Greece was indeed a somewhat civilized society back in the first century – certainly more so than any other society we’ve encountered in the bible up till now. Paul continues on his trip; I’d guess that’s to escape further rioting. But those pesky Jews are plotting against him again, so he has to take a detour. Luke must be with him again, from the use of ‘we’ in v 5. Next incident is an amusing account of ‘death by sermon’; those of us who used to attend church can probably relate. Except the victim wasn’t really dead; Paul ‘revived’ him. Does Paul have super powers? Doubt it, the poor guy was probably just winded/temporarily unconscious. 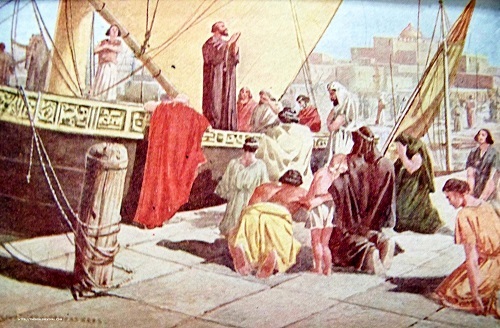 Then Paul bids goodbye and offers advice to the elders of the church in Ephesus. 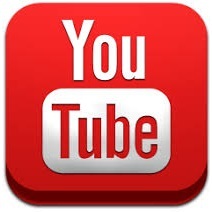 Man, can he talk… it’s all Christianese… repent from sins… tell others the Good News… feed the flock… blah blah blah. But the ‘purchased with his own blood’ bit in v 28 – that imagery always creeped me out, even back when I attended church. And how about warning people to watch out for those ‘other preachers’ who tell lies – everyone else is evil or just wrong… that attitude hasn’t changed in two millennia. And lastly, with a sobbing farewell, Paul quotes Jesus’ most famous words “It is better to give than to receive”. Except… Jesus never said that in any of the gospels. Oops!